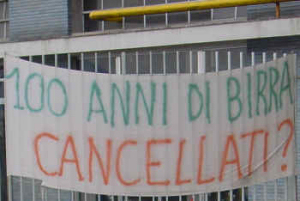 22/09/2004 - Heineken Italia announces to the Labor organizations and the Local Administrations the intention to close the Plant of Pedavena the 31/12/2004 adducing motivations, moreover never demonstrated, of productive inefficiency and objective and logistic limits of the Factory. Their objective actually the concentration of the production and the cost reduction. In 2003 there were already some signs of worrisome for the plant, between which the declaration that the specialties were not considered from Heineken strategic (these productions were made Pedavena) anymore, the lack of investments and, above all, the sale of hydroelectric plant that renders energetically self-sufficient the plant. This had already alarmed the workers and the Labor organizations, that began to involve the local Administrators. After 22/09/2004 - starts a large mobilitation of the workers who, to the outcry of "with Heineken or without Heineken we want to continue to produce beer", involved all the population and the politicians, collecting subscriptions against the closure. This petition has been signed between the others from Giancarlo Galan, President of Veneto Region, from the Bishop of Belluno, the three National secretaries of CGIL, CISL and UIL and over 17.000 citizens. 30/09/2004 - Take their way the political initiatives against the closure: from the Communal and Provincial Councils, to interrogations parliamentarians of all the political alignments and the involvement of the European Parliament. 05/10/2004 - The workers create and publicate in the net a site in order to arrive outside the territory the Pedavena vicissitude. In few days the site is invaded from thousand of support subscriptions; the subscription has been stopped last 11 January at 27,202 subscriptions. It has been surely one fundamental instrument for the happy conclusion of the sale. 11/10/2004 - In front of Assolombarda in Milan where the future of the brewery is under discussion, there are all the Majors of the area of Pedavena together with representative of all the community, politics and parishes to manifestate against the closure of the plant: in total over 400 persons. Heineken for the first time declare its availability to sell the plant to another brewer too. 12/11/2004 - The Ministry of Welfare starts to follow our vicissitudes. 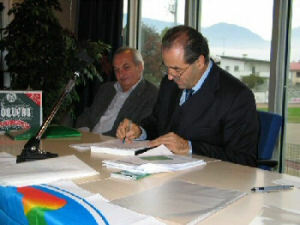 26/11/2004 – 03/12/2004 - There is an agreement between the Social Organizations and Heineken Italia to postpone the closure to 30/09/2005. All the Social Shocks-absorber are granted for the workers and the confirmation that there aren't prejudices to the sale of the factory and the premises Birreria Pedavena and that moreover will be given priority to those that intend purchase the globality of the whole situated (the factory and annexed premises), privileging solutions with industrial vocations and especially to beer production. 12/01/2005 - The Pedavena case is known by the whole nation thanks to articles on the newspapers and national networks. 23/01/2005 - The Committee Birreria Pedavena have birth, with representatives of the parishes, the local associations, the workers of the brewery and Common of Pedavena, in order to organize initiatives to support the cause. 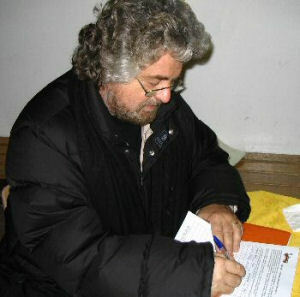 03/02/2005 - The italian famous comedian Beppe Grillo in front of the 3500 persons present at his show in Belluno engages himself in order to prevent the closure of the plant of Pedavena and declares: "I will publicize the situation to save the brewery". 07/02/2005 - The workers carry the case Birreria Pedavena to the fair of Rimini; two days of intense publicity, to Planet Beer - Beverage & Co an important European event dedicated to beer. 11/02/2005 - Heineken finally entrusts UBM of Unicredit group for the sale of the plant of Pedavena. 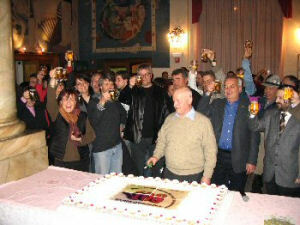 17/02/2005 - Great party organized by the Committee for the 108th birthday of the historical plant, in occasion of the recurrence of the first production in 1897. 23/03/2005 - Arrives the first company interested to the purchase of the brewery: it is the Kopparbergs Swede, represented in Italy by the company J&D Royal. The Kopparbergs directly manages 4 plants in Sweden with a total production of 1 million hectoliters of beer and previews to continue the production of the historical Pedavena beer, side by side with their Sofiero brand and starting an activity in the field of the sidro and the water as well. 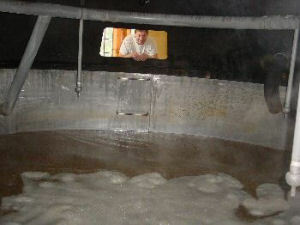 08/04/2005 - Even in 2005 the quality of the beer Pedavena has not decreased, in spite of the situation of closure. In fact, in occasion of the important international competition "Wine & Spirit International Beer - Challenge 2005" in London, where participates beers from all the world, the beer produced in the plant Heineken of Pedavena gained 2 bronze medals. 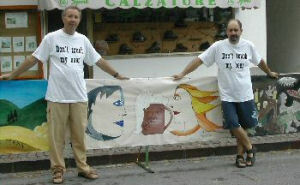 23/04/2005 - Continue the initiatives to support the brewery: the committee invites thousand artists to realize a work inspired to the historical factory on a cloth of 200x75 cm. There has been realized beyond 200 burlaps exposed in many occasions. 18/05/2005 - The vicissitude of the brewery becomes a book: Alessandro Tibolla and Raffaella Gabrieli, writers of the Gazzettino, publish the most meaningful articles from the Gazzettino on the subject, from January 2004 till today. 20/05/2005 - During the famous ride "Giro d'Italia" the Union Representatives of the brewery organized a stand in Fonzaso (a village close to Pedavena where the ride pass) with some burlaps where it is possible to read "Pedavena = Beer also without Heineken". The workers distributed inserts and proposed assays of their famous beer, provoking the interest of the supporters of the bikers. 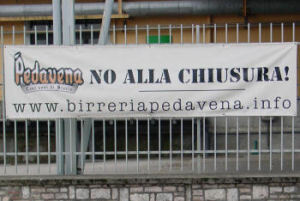 10/06/2005 - First encounter with the Ministry of Welfare in Rome: by now is clear that the resolution of the issue Pedavena brewery is more and more difficult to catch up. Heineken communicates that credible industrial plan has been presented to them till now. 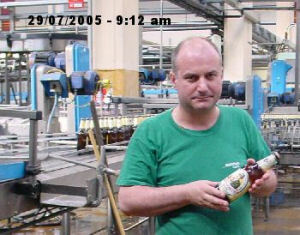 22/06/2005 - One brew of Moretti Beer, yesterday, has been the last produced for Heineken in the factory of Pedavena. Approximately 354 hectoliters represent the 504th brew of 2005. Time to clean up and prepare the brewing hall to the closure. 15/07/2005 - The Ministry of Work will mediate with the Swedish company Kopparbergs for the acquisition of the plant of Pedavena. A letter from the general executive manager of the Scandinavian society, declared officially their interest for the brewery. 30/07/2005 - The clock marked 9,12 a.m. when the last bottle of beer for Heineken - one Moretti of 66 cl. - exited from the packaging hall. Although, Pedavena continuous to gain prizes: during the Australian International Beer Awards, the Moretti Double Malt has been rewarded with the gold medal. 06/09/2005 - Also the Queen of Holland is involved to the fate of the brewery. The queen answered to the letter sent by the communal administration of Pedavena. The issue, wrote the Queen, has collected her particular attention and will be taken in charge by her Ministry for the Foreign policies. 13/09/2005 - The encounter to the Ministry is postponed to 12 of October. At the moment are interested to buy the brewery the Swedish Kopparbergs and the South Italian Tarricone Spa, producers of Beer Morena. 20/09/2005 - A new purchaser seems interested to Pedavena. Pool of entrepreneurs from Veneto and Friuli, between whom the producers of the Birra Castello di Udine, have contacted Unicredit. 30/09/2005 - The bell of the brewery of Pedavena that for more than a century gave the rithm at the small country in province of Belluno has played for the last time, in an unusual hour four o'clock in the afternoon. The fellow countrymen have gathered together to cheer for the last time. The brewery of Pedavena, founded in the 1897 from Luciani brothers transformed in the sixties in the Dreher group and bought in 1974 by Heineken, closed today the clappers. 12/10/2005 - Meeting at the Ministry: Castello of Udine and Tarricone of Potenza will be the two companies to deal with Heineken the acquisition of the factory. The Kopparbergs Swede in the meantime has been excluded from the negotiations because its proposal has been defined a not acceptable offer. 22/11/2005 - The negotiation is complicated: the dispute for the sale of the historical brewery seems to be blocked. The multinational has not still decided between the offerers Tarricone and Castello. The mayoralties promise a hard fight. 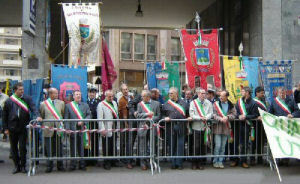 A march towards the Dutch main company, passing before in Milan is planned. 03/12/2005 - The meeting at the ministerial table dedicated to the vicissitude of the Birreria Pedavena is postponed to Thursday 22 December at 11,30. 20/12/2005 - Another delay is decided by the undersecretary of the Welfare to 10 January 2006. The negotiations need some more time to be affinate; a cautious optimism appears. 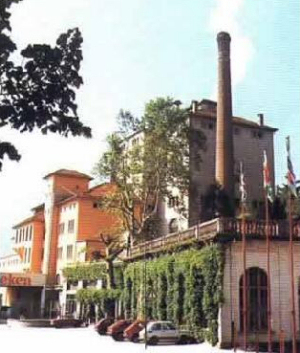 10/01/2005 - And finally the so hoped news arrives: Heineken sells the brewery of Pedavena to Birra Castello Spa, the company of San Giorgio di Nogaro, in province of Udine that will take the place of the Dutch multinational at the beginning of March.